Left Your Survival Can Opener Behind Yet Again? a) It’s fast and convenient. b) You don’t own a manual can opener or can’t find it. However, what if there is a long term power outage and you can’t use your electric can opener? Or, you have to bug out and forget your manual can opener, what then? Not to despair, there is a simple way to open a can without one. 1. 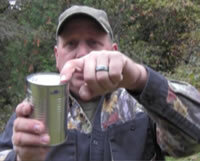 Place the end of the can you wish to open on a rough but flat cement surface or a flat rock. Rubbing end of can over cement to break seal. 3. Carefully remove the lid of the can and eat the bounty. Opened cans ready to eat! Watch the video and see how it’s done. If you have no desire to try this handy trick for making a survival can opener, always have a manual can opener, like this one from Survivalist 101, stored in your bug out bag (BOB). It also fits on a key-chain.